I loved this Baby Kale, Mozzarella, and Egg Bake so much I made it several times in a row for a heat-and-eat breakfast that’s low-carb, Keto, low-glycemic, gluten-free, meatless, and South Beach Diet friendly! Use the Diet-Type Index to find more recipes like this one. Click here to PIN this tasty Baby, Kale, Mozzarella, and Egg Bake! A couple of months ago I came up with a recipe for Spinach and Mozzarella Egg Bake, which turned out to be one of my personal favorite breakfasts. Then I discovered the fantastic Earthbound Farm Mixed Baby Kales at the store near my house, so of course I had to try the recipe using kale. I loved that version as well, and at first I just thought about adding a note to the spinach recipe saying that I liked it with kale. But I really wanted all my fellow baby kale fans to find this recipe, and knowing how the internet works, I decided this Baby Kale, Mozzarella, and Egg Bake deserves a recipe post of its own. How much did I love this cheesy egg bake with baby kale? When I tested the recipe I ate this for breakfast three weeks in a row before I finally switched to something else! I love to use Earthbound Farm Ready-to-use Organic Mixed Baby Kales that made me try this recipe with kale. I love this product (and Earthbound Farm has never given me any or paid me to promote it) but if you can’t find it you can use chopped kale to make this and just cook it slightly longer before you assemble the dish. The baby kale only needs about a minute of cooking at high heat to wilt it before you put it into the casserole dish. Remember the kale will cook more when the egg bake is cooking in the oven, so barely wilt it here. Spray your casserole dish with olive oil or non-stick spray and spread out the wilted kale in a single layer. Then spread the mozzarella and sliced green onions over the kale. Beat the eggs in a bowl of measuring cup and then pour them over the kale/cheese mixture. Then use a fork to gently “stir” so the eggs are well distributed into the kale and cheese. I call this type of recipe an “egg bake” rather than a breakfast casserole, because there is a generous amount of veggies and cheese and just enough egg to hold it together. And here is the Baby Kale, Mozzarella, and Egg Bake after it baked about 30-35 minutes. I cut mine into 6 servings, for a one-dish breakfast that has vegetables, cheese, and eggs. This Baby Kale, Mozzarella, and Egg Bake is perfect for a heat-and-eat breakfast. Spray an 8 1/2 inch by 12 inch glass or crockery casserole dish with olive oil or nonstick spray. Then stir just until the kale is wilted, about 1 minute for baby kale or 2-3 minutes for chopped kale. Transfer the kale to the casserole dish, spreading it around so all the bottom of the dish is covered. Layer the grated cheese and sliced onions on top of the kale. Pour the egg mixture over the kale/cheese combination, and then use a fork to gently “stir” so the eggs, kale, and cheese are evenly combined. Bake about 30-35 minutes or until the mixture is completely set and starting to lightly brown. Serve hot. This is good with light sour cream. I also like a little Green Tabasco Sauce sprinkled on the top. One of the best diet tips I know is to eat vegetables for every meal, and this low-carb recipe is a great way to get some veggies for breakfast. This would be great for any phase of the South Beach Diet and most other low-carb eating plans. South Beach would recommend low-fat cheese but other low-carb diet plans may prefer full-fat cheese. Absolutely delicious! Fed it to children ages 2-5 years old and they devoured it! Thanks for the great recipe. Thanks Kathy; hope you enjoy! Could I make this ahead of time (tonight) and let it sit in the fridge overnight, then bake in the morning? I haven't done it that way, so I can't say for sure how it would work. I think it might, but the mixture will be so cold, so the cooking time might be off. And I don't know how that will affect the results. Let me know how it works if you try it! I started back on Phase 1 two days ago, so decided to peruse your site for Phase 1 recipes. I'd picked up baby kale to make another of your recipes, but I just couldn't stand looking at it in the fridge anymore. My husband and I love kale, and I have to get back into the routine of eating breakfast. He usually doesn't like my breakfast casseroles, but he loved this one. I added sausage to his side, and mushrooms to my side. Yum! Jessica, so glad you enjoyed it! And getting the 7 year old to eat kale, wine! And that should say WIN, not wine! I made this for brunch on Saturday and my family LOVED it (even my picky 7 year old)! They're begging me to make it again! I didn't have any green onions on hand, and I subbed Lawry's Seasoned Salt for the Spike Seasoning (I can't seem to find Spike anywhere and I had Lawry's on hand). Next time I make it I'm going to try to have all the ingredients, and I'm sure they'll like it even better! Great recipe! Thanks for answering 🙂 Genius that I am, I just noticed that you actually explain everything in the actual recipe! Yes you are just cooking the kale enough to wilt it. I'm new to kale, so the first step sort of confuses me…am I just putting the kale in a pan and frying it for a minute? do I add anything to it? Thanks 🙂 it sounds great! Gina, that will be fine; you might want to add 1 or 2 more eggs to the mixture. I don't think the cooking time will be much different but I'd keep an eye on it. Will a 9×13 size glass dish work for this recipe? Can't wait to try it! Thanks Liz; hope you enjoy! Can not wait to try this Kalyn! It's in my oven as I type..just used sharp cheddar instead of mozz. I can't wait! I just made this! Delicious. I used spinach instead of kale and added sweet onion and mushroom along with the green onion. I forgot to grease the dish, but it's not too bad. I also forgot to add the cheese – scatterbrained today I guess, but I sprinkled some shredded on the top when I took it out. I think I like this better – skim cheese is a little lacking in flavour and this keeps the flavour right on the outside of the food. I eat this with salsa, it is so tasty. I also did the calorie information – only 172 calories per 1/6th of the dish! Very. very low cal. I'll probably eat it with some toast. You can freeze this, but it does change the texture a little and the eggs release water when they thaw. I used to freeze this type of egg casserole, but now I greatly prefer to just keep it in the fridge and eat all week. 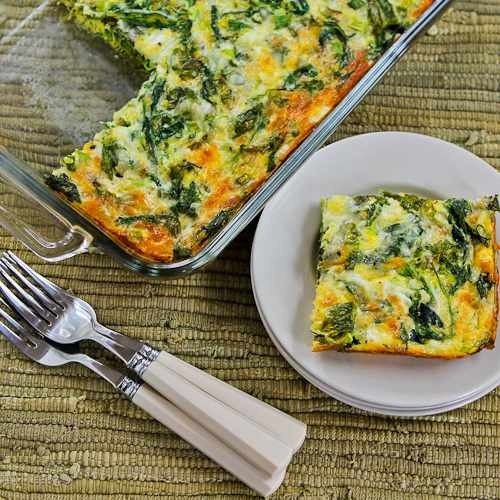 It will last at last 7-8 days in the fridge and is great to reheat for a quick breakfast. This looks amazing—wondering if it would freeze well? So glad to hear people are enjoying this! Made this morning! It was lovely. Sprinkled a little chopped Pancetta on a third for my non-diet-y husband. Even my 10 year old daughter said "mm!!" I loved this! Was so fast! I added butternut squash and pieces of asparagus to mine. Was great. Len, totally your choice on that! Made this twice. Second time used 7"X11" pyrex and liked it better. The dish made in the larger pan seemed a bit dry. We still made 6 servings and topped it with a local organic salsa. It turned out fabulous! I will eat it with fresh cucumber salad all week long. Next time I will add more feta and also a generous amount of fresh parsley moving toward the spanakopita flavor. If you used the amount of cheese I said and cooked it for full, I can't imagine why it wouldn't have melted. Maybe it was the cheese you used or your oven is not as hot as mine? But truthfully I am stumped. Hi Kalyn, made this yesterday and the cheese didn't melt the way I expected it to. It was dry. What can I do the fix this as the idea is great. HAve made many of your recipes and have loved them. Hope I can fix thiss. Mouth watering recipe by looking at the picture of the salad displayed. I cant wait making it myself. Great step by step advice and recipe.. Thanks for such a healthy diet recipe. I think Swiss Chard would be great in this! I've used this recipe before and love it. I just planted some swiss chard,and think I'll try it with that too. Not sure how that will come out,although I do like spinach w/eggs. What do you think? Thanks as always Kalyn. Jeanette, I think veggies at breakfast are a good thing to get used to! Joanne, right now I have 3 packs of this in the fridge, so I definitely love it too. I buy that mix all the time! Along with their power greens. SO GOOD. I love that you get so many nutrients at breakfast with this dish! I love the idea of adding kale to breakfast. I've juiced kale and served it for breakfast sauteed and served it on top of toast with a poached egg. My husband was a bit puzzled when he saw vegetables at breakfast time, but he ate it all up! Today I found the Earthbound Farms baby kale on sale at Fresh Market by my house 2/$5.00 so I bought three packs of it. But I haven't seen it at any other stores in Utah so I see why people say it is hard to find. The Farmer's Market sounds like a good idea. So glad people are liking this idea. Yes, it is a baked frittata. Baby kale is tough to find at supermarkets; when I find it here in San Diego, it's usually at farmers markets. I just love this recipe, Kalyn and will definitely try it. It'd be ideal for brunch, lunch or dinner. It's a baked Fritatta! I LOVE this idea. I'm going to have to try something similar soon. I have yet to find this baby kale mix in my local markets, so it's time to go a bit farther afield, if for no other reason that I want to make this egg bake. It's just the kind of thing I love for breakfast, and a great way to keep up with my goal of eating more kale this year. I also love that EF Baby Kale! What a great use for it. Thanks Deborah! I hear that Whole Foods has it, but I get it at Fresh Market. Dennis, thanks for that nice feedback! That looks absolutely delicious. the colors alone make it appetizing. I love this – and I love the baby kale! I need to look for that!